Sometimes we need to break away from what we are doing and take time out for ourselves to regain our focus and senses. Wellness zones and Wellbeing Pods, previously written off as fads and buzz words are now finding their way in to the established design and build community. 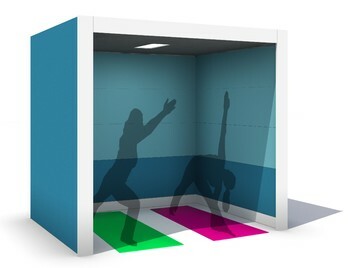 ‘’Movement zones” are also being specified at the early stages of the design process, these zones or areas are for activities like yoga, massages and stretching. The reason for Health Zones appearing across working environments is because most employees now know that the key to workplace productivity is having happy and healthy employees. Wellbeing Pods offer a dedicated space for people to engage in their preferred activity without interruption and ambient noise. These activities can be enhanced with online learning resources as monitors can be mounted to the inside of the acoustic panels. You can book your allocated time in some pods with an online booking system app which means you can organise your time and day in an efficient way. Breathing exercises are very often recommended for stress relief as a stand-alone strategy or in conjunction with meditation, yoga and other stress relief techniques. The Breathing Pod allows you to practice breathing exercises and other techniques without noise or distractions. Fully enclosed with a full ceiling, the Pod stays light, airy and fresh, yet privacy can be retained both acoustically and visually. Wellness Zones are becoming a feature within offices and other working environments from quiet meditation zones to fully functional gyms. Harbour Yoga Booth provides a peaceful environment and space for personal reflection such as meditation or yoga. There are many exercises and yoga stretches you can practice at your desk but you may find it a little awkward and could be distracted easily. Providing a dedicated space for exercise and meditation away from the desk allows a more relaxing session to unfold. You no longer will have a problem finding a quiet spot to meditate or reflect at work. 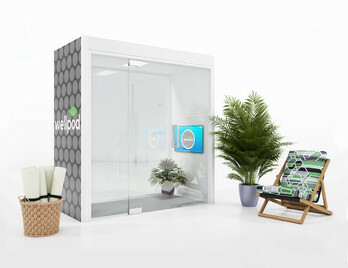 The Well Pod offers a peaceful tranquil haven with soft acoustic lined panels allowing better focus and concentration. With the option of a 32" Samsung monitor, you can immerse yourself in online yoga, meditation or mindfulness classes or lessons. Sleep Pods offer you a sanctuary for rest and recharge in privacy and security, in your otherwise busy environment. The simplistic design blends freshness with superior comfort and practicality, ideal for a short power nap, a chill-out or thinking space. 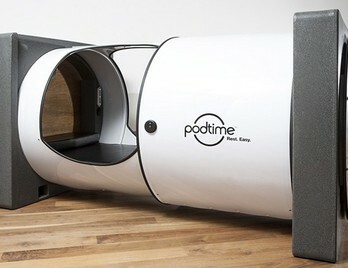 Sleep Pods can also encourage mindfulness or any other form of meditation as it offers complete privacy and peaceful haven. Monitors can be mounted inside which could broadcast up to date health videos or audio podcasts?